This kitchen went from drab and dated to warm and inviting. Click the picture to see more of this remodel. Changing the color in your kitchen is just one of the ways that you can spruce it up without committing to a full remodel. Color can change the dynamics of any room, including the kitchen. If you want to improve the look and feel of your kitchen before selling your home, think about how important your kitchen is to prospective buyers. Kitchens and bathrooms are known to be the two rooms that appeal the most to house hunters, so it’s not something you can afford to overlook. Below are a few ideas for using colors to make your kitchen stand out. Your cabinets, countertops, walls, and floor are all major elements in your kitchen. How well do the colors work together? While white is a safe and tasteful option, do not rule out bolder colors. From turquoise to royal blue and even mint green, bolder colors can completely change the way you feel about your kitchen. Bolder colors can give your kitchen more character and personality. If you still want a neutral wall color, consider gray. Gray works well with the trend of white cabinets and quartz countertops. It also complements stainless steel appliances as well as black ones. For an open kitchen, it is important to consider whether you want the kitchen to feel like a separate space or if you want it to flow seamlessly into the eating area. Consider using the same color in both rooms to help your dining room blend into the kitchen. While the colors in a kitchen can come from numerous different elements, the backsplash is often one of the most noticeable. Your choice of backsplash color can help to tie the rest of your kitchen’s décor together. Warmer colors like red are believed to have a stimulatory effect on the appetite, which makes it a good option for a kitchen. White is thought to energize a room and make it feel clean and fresh. Additionally, white and stainless steel kitchens serve as a good backdrop for the food, allowing it to stand out by being the only color in the room. It is possible to use your kitchen’s color palette to give an impression of cleanliness without it seeming sterile and impersonal. Paint a wall before doing any major work. This is an easy way to see how your chosen color will look and the fix is simple if you decide not to go with it. 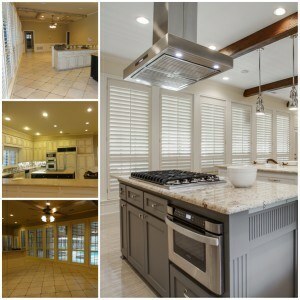 Kitchen design is a big part of improving your home’s value and color is a big part of kitchen design. By choosing the right colors, you can impress prospective buyers and get good a good return on your investment. From interior painting to a new backsplash, DFW Improved does it all. Click here to request an estimate on your project, or simply give us a call at 972-377-7600.